Mosa’s commitment to sustainability is convincing: The panel of judges of the Cradle to Cradle Challenge Awards has acknowledged Mosa’s strategy with the Award in Gold. 20 top architects were asked to select their favourite from a large number of brands representing all kinds of building materials – from bathroom fittings, windows and doors up to outdoor materials such as bricks. The architects evaluated the complete sustainability strategies of the companies: They rated the production with climate-friendly raw materials as well as a low consumption of water, energy, and the waiver of harmful substances. They also rated how companies reduce waste to a minimum and re-integrate it into the production process. Finally, they also looked at the commitment to the own employees, their working conditions, training, and family support. The result: in the overall judgement of all criteria, Mosa could reach the first place and thus win the much sought-after trophy. Dirk van Lier, Mosa’s Marketing Director and Simon Platz, Mosa’s Market Manager, received the Award as representatives of the company. The jury was specifically impressed by the commitment of Mosa for the environment. The company consequently focuses on the sustainability of its products. 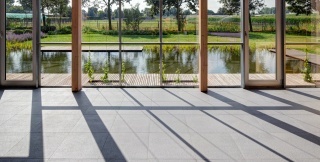 Mosa is the first manufacturer of ceramic tiles to receive the Cradle to Cradle Certified™ Silver certification for nearly the whole collection. The label is highly esteemed and contributes to the listing of Mosa in several international databases, having a positive influence on building labels such as LEED, BREEAM, DGNB, and HQE. The company regularly publishes its activities and developments in its sustainability report. To learn more about Mosa’s sustainability strategy?